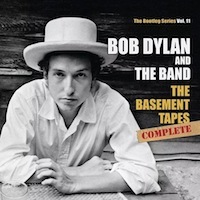 Apart from a handful of completely distorted or fragmented tracks, everything that Bob Dylan and The Band recorded in the basement of "Big Pink" in 1967 finally sees the light of day on the 6 CD-edition "The Basement Tapes Complete". A selection of 38 essential tracks is also available as "The Basement Tapes Raw" on 2 CDs. All songs have been carefully restored and digitally remastered for the very first time. The "holy grail" for Dylan enthusiasts.